Bombagira is a female entity who once lived amongst us. She manifests herself in the body of the medium to help everyone (man and woman) with issues in love, relationships and to help us attract a new partner. She can also help us stand out and feel more confident. An admission fee of £15 per person is required to attend (if purchased in advanced). On the door, admission will be charged at £20. It will be a cocktail party, hors d’oeuvres and appetisers will be served with champagne. Dinner will be served afterwards. Wine and soft drinks will be served. Cowrie Shell (Buzios) reading is the art of foretelling the future used by traditional African religions. as well as receive messages from the Orixas. 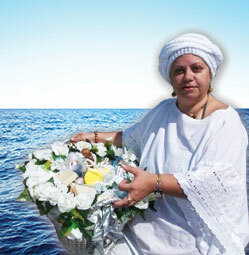 I am Mae Eja, Priestess and founder of Church of Candomble. This page gives everyone a chance to communicate with me directly, an opportunity for those who are interested in learning more about the Orixas and our fascinating religion, which embraces culture, history and tradition. It is a beautiful religion, filled with secrets and customs inherited from our ancestors, with hierarchies and traditions passed down from father (mother) to sons (daughters). I will discuss a lot of topics that are suitable for everyone, like how to transform your life with the help of the Orixas. I will write in a concise and objective way so everyone can grasp the wonderful world of Candomble. Each week I will be here explaining a little bit about the Orixas as well as our Candomble, Angola Nation. If you have any queries our would like to discuss a topic in particular, please send your question or suggestion to info@churchofcandomble.com. Over 7,000 people currently sleep rough on the streets at any given night. Invisitble and forgoten, they are cold, hungry and ill. Our soup run project is a much needed aid to bring them warmth this winter, but we need your help. Food Donation 18 of July 2016.